At Carson & Carson, DDS we understand that having a tooth pulled can be a nerve-racking, uncomfortable, and sometimes painful experience, but our attentive dentists are well trained in making the experience as quick and as smooth as possible. With over 45 years of experience serving the Ventura County area, we have performed countless successful tooth extractions with most patients having little to no scarring and no discomfort after the procedure. Visit our wisdom tooth page for more information about wisdom tooth removal services and pricing. As requested by our patients, our dentists are California Board Certified in IV sedation an IM sedation as a treatment option for a truly forgettable tooth extraction. Schedule an appointment with the Oxnard dentist with over 45 years of experience in the fields of dentistry – Carson & Carson, DDS. Severe Tooth Decay: Tooth decay, to the point beyond saving, is still the most common reason for a tooth extraction with almost 70% of extractions done for this reason. Crowding: Sometimes teeth grow in too large for the available space in the oral cavity, and extracting teeth can help create more room for the remaining teeth to grow and align properly. For individuals straightening their teeth with braces, an extraction is sometimes required to create the space necessary to allow teeth to straighten. 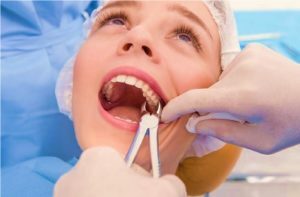 Baby Teeth Extractions: Not all baby teeth fall out on their own, and some must be extracted by a dental professional to help create room for permanent teeth that are growing in. 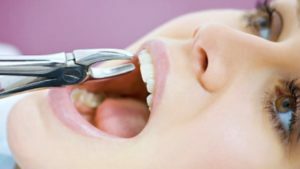 Dental Infections: Among the many variations of dental infections, there are some infections that require a tooth extraction because they are either inaccessible without pulling a tooth or have not been cured by antibiotics or Root Canal Treatment. Individuals undergoing chemotherapy or an organ transplant have an elevated risk of getting dental infections because their immune systems are compromised and may be good candidates for a tooth extraction in the case of infection. Also known as the dreaded, third set of molars, wisdom teeth are removed for most people who simply do not have the space to house another thick set of molars in the back of their mouth. Often times, these teeth cause pain when they become impacted (stuck in the jaw) and are removed during the patient’s teen years for an easier surgery and recovery. 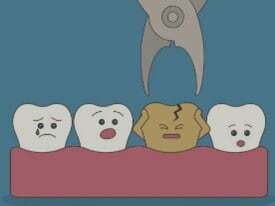 Visit our wisdom tooth removal page for more information on the specifics of getting your wisdom teeth extracted. as possible. First, we take an X-ray or CT Scan of your mouth to map the affected areas before the procedure. Then, we use this information to determine: the relationships between teeth, the relationships of nerves to teeth, or determine if any infections, bone disease, or tumors are present before the procedure. A few medical conditions may require additional antibiotics before the procedure as well and these can include having: an impaired immune system, Liver cirrhosis, an artificial joint, a history of bacterial endocarditis, a Congenital heart defect, or a man-made heart valve. We perform both major types of extractions which are Simple and Surgical Tooth Extractions. Simple Tooth Extractions are performed on visible teeth that can be removed with the proper use of leverage and force. In this procedure, the tooth is lifted with the help of an elevator and dental forceps and then moved around until loose enough to pull out. This is typically a quick and easy procedure that does not require more than a local anesthetic. Surgical Tooth Extractions are performed when the tooth is not visible or not easy to access. Teeth that should be extracted this way are commonly either broken below the line of the gums or never fully erupted from the gums, and may require drilling into the jawbone to be accessed. DO NOT drink from a straw, spit or rinse your mouth forcefully in the 24 hours following a tooth extraction. Creating suction in the mouth can weaken the blood clots or stitching in the wound leading to further bleeding and a slower healing process. Apply ice to affected area for 20 minutes at a time. Limit physical activity in the day immediately following the extraction. Eat soft or cooled foods for a few days. Gentle rinsing of the mouth with half of a teaspoon of salt mixed into a glass of water is advised. Take painkillers as needed/instructed. NSAIDS such as Ibuprofen and Advil are effective in treating the pain caused by a tooth extraction, but can worsen a situation that won’t stop bleeding. Contact your dentist if the blood clot has not formed in first couple of days and the bleeding will not stop, as this may indicate a condition called Dry Socket, which may require additional treatment from your dentist.